Candace is a former member of the Canadian Women’s National Team with 114 caps, 103 starts, and 6 goals as a defender. She is a 2018 Canada Soccer Hall of Fame Nominee. She represented Canada at the 2007 and 2011 FIFA Women’s World Cup. Candance won an Olympic Bronze Medal at the 2012 Olympics Summer Games held in London. She won a Bronze Medal at the 2007 Pan-Am Games in Rio. Candace is a former WPS and NWSL professional player, having played 52 games with the Boston Breakers, FC Gold Pride, Western New York Flash, and the Washington Spirit. 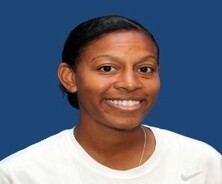 She won WPS Championships in 2010 with FC Gold Pride and in 2011 with the Western New York Flash. Candace played her collegiate career at Notre Dame from 2000-2005 (ACL Redshirt year), serving as team Co-Captain (2005), winning First Team All-BIG EAST (2001, 2002 & 2005), NSCAA First Team All-American (2002), BIG EAST Defensive Player of the Year (2002), and Soccer America Freshman All-American (2001). Candace has served as a technical coach since 2013 with Canada Soccer Women’s YNT programs. She has coached with Arlington Soccer since 2014 with the 2002, 2001, 2000 and 1999 girl’s age groups. She won a VYSA State Cup in 2017 with the Arlington 1999 Girl’s Red team. She started a performance-based company called 90Plus Performance, focusing on soccer athletes.